Numerous problems can easily arise when you’re trying to imitate human binocular vision using a pair of cameras. The cameras must be placed exactly at the same horizontal level, they must be synchronized, and they must produce images with the same color and brightness. Otherwise, the viewer may suffer any number of consequences from watching the 3D video—from headaches to irritation and incorrect perception of the video. Eye strain may cause dizziness and nausea, but it is worth noting that these symptoms may signal not only a problem with the stereo quality, but also eye problems in the viewer. Unfortunately, even slight variations from ideal camera placement and synchronization can noticeably decrease 3D-video quality. An imperfection in even the most modern equipment and the inevitable differences in the videos can also affect the result. The main problem in this case is vertical parallax in the stereo: vertical shifts are poorly perceived by the human brain. They can also cause problems when processing the stereo video. For these reasons, stereo correction algorithms are in high demand. 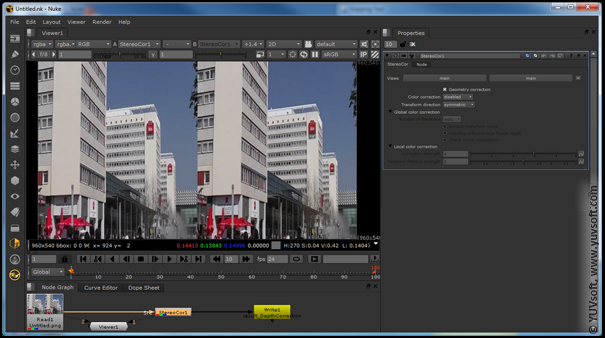 The YUVsoft Stereo Correction plugin for The Foundry Nuke eliminates both geometrical and color imperfections in the captured video stereomates automatically. After you load the stereomate sequence as input, Stereo Correction returns the stereomate video with equalized color shades and purely horizontal parallax. This approach can improve the quality of the source stereo video or perform stereo-to-multiview conversion. 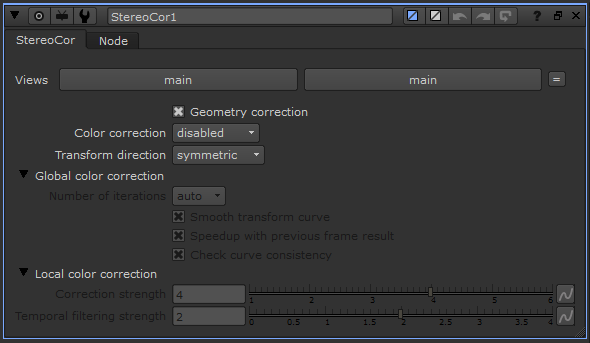 Stereo-to-Multiview Conversion plugin for Adobe After Effects.